Yu-Gi-Oh! TCG Event Coverage » Check Out the New Regional Qualifier and Dragon Duel Game Mat! Home > 2019/02 - Chicago, IL, Yu-Gi-Oh! Championship Series	> Check Out the New Regional Qualifier and Dragon Duel Game Mat! 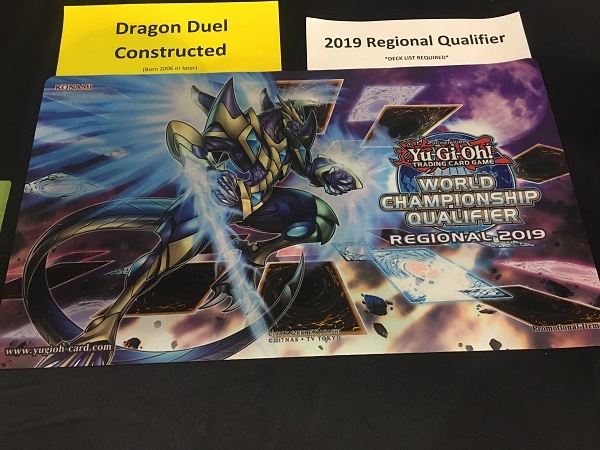 This new Game Mat is available here in Chicago, Illinois to Duelists who win a 2019 Regional Qualifier and to young Dragon Duelists who place in the Top 4 of the Dragon Duel Tournament. You can win one of these awesome new Game Mats by placing in the Top 8 of a Regional Qualifier near you!